Company: Cichlasoma grammodes (Sieve cichlid) is very aggressive and should only be kept with other fishes in very large aquariums. 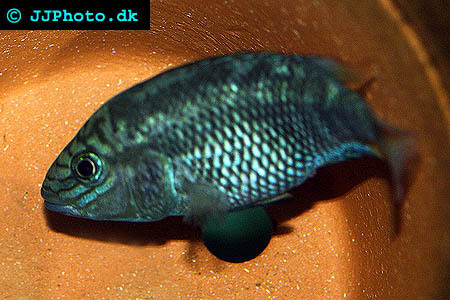 Aquarium setup: Cichlasoma grammodes (Sieve cichlid) should be kept in a large aquarium decorated with roots and rocks. Plants are not necessary although floating plants sometimes are appreciated, especially by the fry. This species requires high oxygen levels. Feeding: Cichlasoma grammodes (Sieve cichlid) accepts most food sources but can preferable be feed live fish a couple of times a week as a supplement to their diet. Do not feed just live fish since much fish has low nutritional values. Breeding: Cichlasoma grammodes (Sieve cichlid) spawn on a flat rock. The male guards a territory around the breeding ground while the female guards the eggs. This species can become very aggressive when they breed and any other fishes should be removed unless your aquarium is large enough to allow other fishes refuges outside the breeding pair’s territory. Breeding pairs sometimes become aggressive towards each other and have to be divided.